I regularly help pre-seed entrepreneurs identify and evaluate potential startup opportunities. The following is a set of heuristics I’ve developed and collected over the years that might of use. These heuristics are just a starting point to identify interesting, unsolved problems in the world that may turn in to great startups. Entrepreneurs must still go deep on understanding their customers, the business model, have a clear answer to Why Now? there is a big shift in the market, and focus on identifying problems rather than generating ideas that sound good. Tools inside a big company — High growth companies often first experience a problem other companies will soon face and solve it internally. Bringing these tools to everyone else can work well, e.g. Asana was inspired by the Facebook internal tasks tool, Cloudera was inspired by Facebook’s internal data infrastructure. Market validation from other startups — Find a company that recently raised a series A and approach solving the problem differently. Often the first company to identify an opportunity will not win but does indicate customers have a real problem they want solved. Revisit ideas that were too early — Look back at ideas that were hot 10 years ago because entrepreneurs have a tendency to be too early. See if any might make sense now, e.g. Instacart vs. Webvan. Invert a successful company’s core competency — Take the core strength of a company and flip it on its head to see what a product experience may be if you did the opposite, e.g. Snapchat was based on ephemerality and Facebook based on permanence of identity, or Southwest was based on a point-to-point model with only one type of plane whereas other airlines use a hub and spoke model with multiple types of planes. Extend consumer behaviors to businesses — Take a product used by consumers and think about how it might apply to prosumers, enterprises, and small businesses, e.g. LinkedIn vs Facebook. Turn open source projects in to SAAS businesses — Find open source projects that are very popular and turn these in to out of the box services for enterprises, e.g. PagerDuty is like Nagios. Compete with old world industries using software — Find an industry that is resistant to using software and build a vertically integrated version to compete with that industry, e.g. Atrium vs. law firms. Understand how teens communicate — Figure out where teenagers are spending their time to see what the communication products of the next decade may be. Teens are unencumbered and very creative, so seek to understand the motivations instead of judge. Travel and observe non-software solutions — Travel to new places to discover non-software solutions that other countries/people/markets have come up with to various problems, e.g. I was in Moscow in 2006 and people could just hail any stranger on the street to drive them somewhere like a cab. It may not have been a big leap if you saw this behavior to Uber/Lyft on your phone. Look at behaviors in certain geographies — Smaller, homogenous culture countries (Sweden, Korea, Japan) are early adopters of many technologies. Spend time there to understand what they are doing that isn’t globally popular yet, e.g. watching other people play video games or mobile payments took off in these markets very early relative to the US. Unbundle the government — Think about what services the government offers and how you might build a profitable business model around these, perhaps even by offering these services in a more cost-effective way back to the government, e.g. SpaceX is a private NASA, FedEx is a private postal service. Verticalize an already successful business — Find a massively successful business such as Salesforce and target it for a vertical that is traditionally challenging to access, e.g. Veeva is a pharma industry specific CRM worth $15B+ and raised only $7M in funding. Build something for a distribution channel — Identify a new distribution channel that would enable access to a new customer, and then think through what that customer wants that the distribution channel does not want to provide, e.g. Pinterest and Yelp built on SEO, Paypal built on eBay, YouTube embedded inside MySpace before MySpace had a video product. Draft on a regulatory shift — Build behind a big regulatory shift to compete with large incumbents who will be slow to move and have regulatory + technical baggage, e.g. Oscar Health after Obamacare. I’m sure some companies will spin up to help people transition to a post-GDPR world. I’m sure there are other good heuristics to use as a starting point. If anyone sends me others, I’ll add them to my blog post as a reference for others. 1/ Right after graduating I worked at @Google and Larry Page said something in passing that has stuck with me for a decade: "Most important problems aren't that hard to solve, it's just that no one has really tried." With some experience, I have come to believe this is 100% true. 1/ HOW TO ASK FOR HELP AS AN ENTREPRENEUR — Every week entrepreneurs reach out to me cold on LinkedIn, Twitter, and email asking for help. I love helping if I can! Unfortunately most people are terrible at asking for help. Here is how to do it properly. There are rarely new ideas in startups. If you have an idea, someone probably already tried it and failed — maybe they mis-executed, there was something counter-intuitive about the customer or business model, or they were too early (correlated with the market not being big enough yet). If you assume other people are smart, which is generally a good practice, then they executed well and there wasn’t anything counter-intuitive going on. Earlier startups were likely just too early. So if you can’t point to an obvious misstep in prior attempts, “why now?” is often the critical question to answer. 1 to 4 are strong answers and generally clear cut. 5 is the trickiest. Behavior change is the most common answer I hear startup founders assert around “why now” for their company. If 5 is true, then you win BIG — these are the “It wasn’t true until it was true” sorts of startups. Facebook, Uber/Lyft, and Snap fall in to bucket 5. The challenge is 5 is the hardest to know looking forward. You can assert it’s true, but it’s easiest to know behaviors/preferences/attitudes changed looking backward. If you can find novel solutions to problems because of new technology, regulation changes, new business models, or a new customer acquisition channel, then you can often win big and win quickly. However, the vast majority of startups assert they can succeed because behaviors have shifted somehow. But the vast majority of these assertions are incorrect. However, the ones who are correct will win big. You can only know if the behavior shifts are real in hindsight, but you have to make educated guesses about these shifts looking forward. And that in a nutshell is one of the hardest challenges of being an entrepreneur or angel investor. There are only four types of metrics – quality, scale, engagement, and revenue. Effective metrics track real value, are sensitive, and easy to understand. When communicating metrics, you should call out how the operational metrics that measure progress against your current tactics will drive the topline metrics everyone at your company understands. Quality – How good is your product at doing what it says it does? Scale – How many people use your product? Engagement – How deeply do people engage with your product? Revenue – How much money do you make? These categories are deeply interconnected — scaling your userbase may drive down your overall engagement rates as new, less engaged users come in. Putting ads in to a product may drive down retention and engagement. Driving up engagement is often one of the best ways to drive growth in the long term, etc. In general, you strive to make your product great for a small number of people, get more people to use this valuable product, deepen engagement with those people, then figure out how to make money from them, and loop back around to figure out how to build a high quality experience for an expanded set of people. Represent real value – The more closely a metric represents the actual value to users and customers the more likely it is to guide a company in the right direction. Sensitive – a good metric will move up/down based on work you do more than exogenous factors. Simple – simple counts and time series are surprisingly effective. 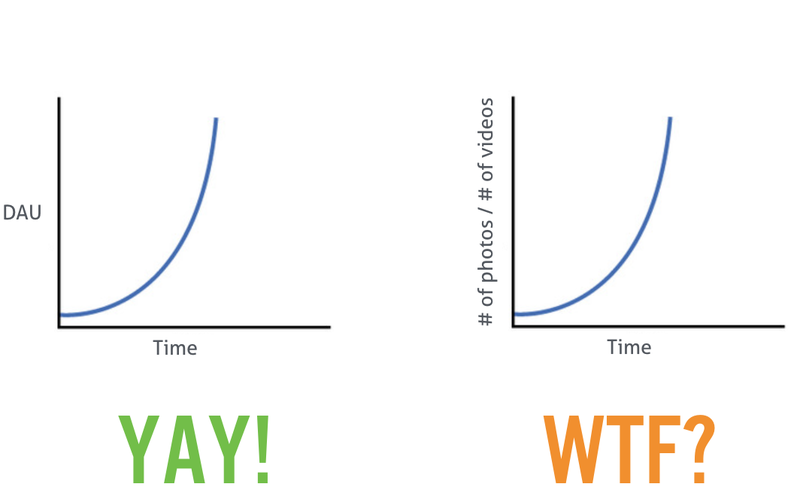 For example, “number of people using our product on a given day” aka DAU is real value (more people using your product is good), sensitive (if you send a lot of notifications or if you are in the press, this will go up), and simple because you can look at the graph and quickly know if things are going well. It’s easy to lose context on why certain metrics are a priority and how all of a company’s metrics fit together. As an employee, this loss of context can feel like there is no strategy. It can lead to teams that struggle to communicate because they do not have context on why other teams’ metrics matter. The reason this happens is that most people conflate topline and operational metrics. Topline metrics measure progress towards your mission. They are high level and stay consistently tracked for years. These are the metrics your board of directors want to know about, such as daily active users (DAU) or revenue. You will have only one or two topline metrics for each of the four types of metrics (quality, scale, engagement, revenue). Operational metrics measure the progress of strategies and tactics. They are in service of a topline metric. For example, using search ads to acquire customers is a tactic, measured by cost of customer acquisition using search ads. The overall strategy you are using may be to pay for new users, measured by an overall blended CAC. This strategy is in pursuit of monthly active users (a topline growth metric). Operational metrics will change as tactics or strategies evolve. However if you articulate how operational metrics roll in to topline metrics, this will not feel jarring because people will understand how the old and new operational metrics were in pursuit of the topline metric. You can/should also reinforce that topline metrics are proxies for the value you want to create in the world, not the end unto themselves, to keep everyone grounded and focused. Here is a simplified example using Google Search. There are many possible operational metrics for each topline metric, and the operational metrics you focus on will change over time. This is a more complicated example because you have a two-sided marketplace with buyers and sellers, and it’s important to measure the health of both sides of the marketplace. The biggest risk in creating a metrics informed culture is that over time, people conflate metrics and goals. Metrics are a proxy for value and an abstraction to help you measure progress. Don’t lose sight of the real goals: to create real value for customers. If you lose sight of the value you are ultimately creating, you can move metrics for the sake of moving metrics, picking incorrect metrics targets, and ultimately will be disrupted by another company that actually creates real value for customers.